Dental implants have revolutionised the cosmetic dental field over the last few decades by providing a permanent solution to missing teeth that act like natural teeth. 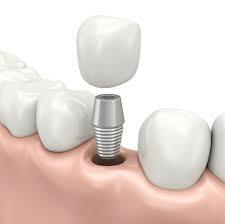 A dental implant is an artificial replacement for a tooth root and is a highly reliable form of treatment. In general the success rate for dental implants is around 95%. They can be used to replace one or more missing teeth by providing the foundation for long-term support of crowns, bridges or dentures. Well maintained implants placed into adequate bone can be expected to last for many years and possibly for your lifetime. While traditional dentures can be uncomfortable and lack retention, preventing you from eating certain foods and affecting your confidence, a well-fitting implant retained denture should sit comfortably in your mouth and allow you to eat all of the foods you enjoy. At Absolute Dental Care, Dr Rhodri Evans uses a pilot guided implant system that allows him to place implants in the most predictable and least invasive way. We also have a CBCT Scanner on site, this enables us to take a detailed 3D scan of the teeth and jaws, ensuring that implants are placed in the optimum location. Rhodri offers an initial free consultation appointment for anyone interested in dental implants. If you would like more information or are interested in arranging a free consultation appointment, please contact a member of our friendly team who will be happy to help. Implants are a safe, well established treatment. It’s probably true to say that implants, much like natural teeth, will last for as long as you care for them. I have some of my own teeth can I still have implants? It depends on the condition of the bone in your jaw. Your dentist will arrange a number of special tests to find out the amount of bone still there. If there is not enough, or if it isn’t healthy enough, it may not be possible to place implants without grafting bone into the area first. After your implants have been placed, the bone in your jaw need to grow onto them and fuse to them. This usually takes a few months. Sometimes the implants may be stable enough when they are placed for the false teeth to be fitted sooner than this. If you are having one, two or three teeth placed, you may have a temporary denture in the meantime. If you already have full dentures, you can keep wearing these while your implants are healing. Your dentures will need altering, to fit properly after the surgery, and a healing cap will usually be placed onto the implant site to protect it.